Throughout your degree, you’ll get opportunities to engage with the legal community and get real-world experience to better prepare for a career in law. Through summer placements, clinics and co-op our students are engaged with the legal community throughout their degree. Our clinical programs are the most extensive in the country, meaning you’ll get practical, hands-on legal experience employers are looking for. Our graduates are ready to hit the ground running. UVic Law alumni are working across the country in all areas of the law—making an impact every day. 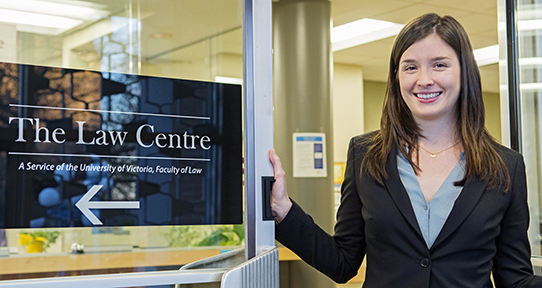 The UVic Law careers office facilitates student placements in law firms, government and public interest organizations and provides resources and one-on-one counselling to our students as they begin their legal careers. Whether you're interested in a court clerkship, a legal internship, a summer firm position, an articling position or another career path entirely, the careers office can help. Sarah Morales (LLB '04, PhD '15) is a professor of Law at the University of Ottawa. She is a member of the Cowichan Tribes, has her JD and PhD from UVic, and her research focuses on Indigenous Law. Many of our alumni now teach in post-secondary institutions in Canada and around the world, and many of UVic's Indigenous alumni have served on or serve as leaders of their peoples. Herman Van Ommen (LLB '84) is a leading litigator and arbitrator, and was Regional Managing Partner of the national law firm, McCarthy Tétrault, until 2016. In 2017 he will become the president of the Law Society of British Columbia. In 2016, UVic alumni constituted 9 of 25 elected Benchers of the Law Society of British Columbia. Andrew Petter (LLB ’81) is President of Simon Fraser University and former UVic Dean of Law. He was a member of the BC Legislature from 1991 to 2001, serving in numerous cabinet portfolios, including Aboriginal Affairs, Advanced Education and Attorney General. He is one of five UVic alumni, of all parties, who have served as ministers in the BC and federal governments. Freya Kristjanson (LLB '87) is a judge of the Ontario Superior Court. She was appointed in 2016 after an exemplary 25 year career as one of Canada's best administrative lawyers. She joins more than 35 UVic alumni appointed to judicial office in Canada. Roshan Danesh (LLB '96) is a lawyer and consultant who works across First Nations and governments on peace-building, complex negotiations and dispute resolution. He has a doctorate from Harvard and writes on law and religion. Kasari Govender (LLB '04) is the Executive Director of West Coast LEAF (Legal Education and Action Fund). West Coast LEAF uses litigation, law reform and education to advance women's equality and legal rights. Kasari is one of many UVic Law graduates practicing public interest law and working to ensure equal access to justice.